• Hardcover: 304 pages • Publisher: National Geographic (March 12, 2019) Become a better birder with brief portraits of 200 top North American birds. This friendly, relatable book is a celebration of the art, science, and delights of bird-watching. How to Know the Birds introduces a new, holistic approach to bird-watching, by noting how behaviors, settings, and seasonal cycles connect with shape, song, color, gender, age distinctions, and other features traditionally used to identify species. With short essays on 200 observable species, expert author Ted Floyd guides us through a year of becoming a better birder, each species representing another useful lesson: from explaining scientific nomenclature to noting how plumage changes with age, from chronicling migration patterns to noting hatchling habits. Dozens of endearing pencil sketches accompany Floyd's charming prose, making this book a unique blend of narrative and field guide. A pleasure for birders of all ages, this witty book promises solid lessons for the beginner and smiles of recognition for the seasoned nature lover. 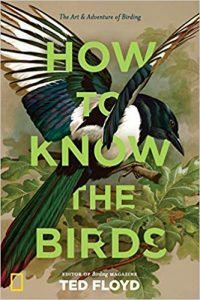 Social Media Please use the hashtag #howtoknowthebirds and tag @tlcbooktours. People who read Pure Florida know that April Fools Day is often, not always, but often a major event here. There was that time I struck oil in the front yard, the meteor strike in the back yard, the skunk ape game cam video, the alien artifacts in the gun range ... you get the picture. This year, no fooling, I have a book you might like for yourself or as a gift for your birding friends. "How To Know The Birds" is a series of essays on birds and birding by Ted Floyd. I love birds, but I don't think of myself as a "birder". The competition and life list aspects of birding don't appeal to me, but I enjoyed many of the essays in the book, especially the Ruby-Throated Hummingbird story of how they prepare for their Gulf of Mexico crossing. If you are a birder, or just want to know more about the birds around us, this book was written for you. It's about natural connections to those we have lost. I gave her this Fringe Tree about 4 years ago. The tree started out as a tiny seedling beneath my own Fringe Tree next to the pumphouse here at PFHQ. 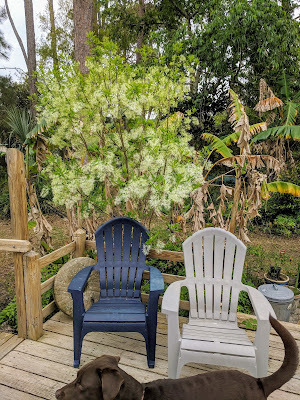 Mom had admired my Fringe Tree while it was in full bloom during a visit. She went on about it so much, that when a seedling popped up beneath it, I potted it and brought it over to her. 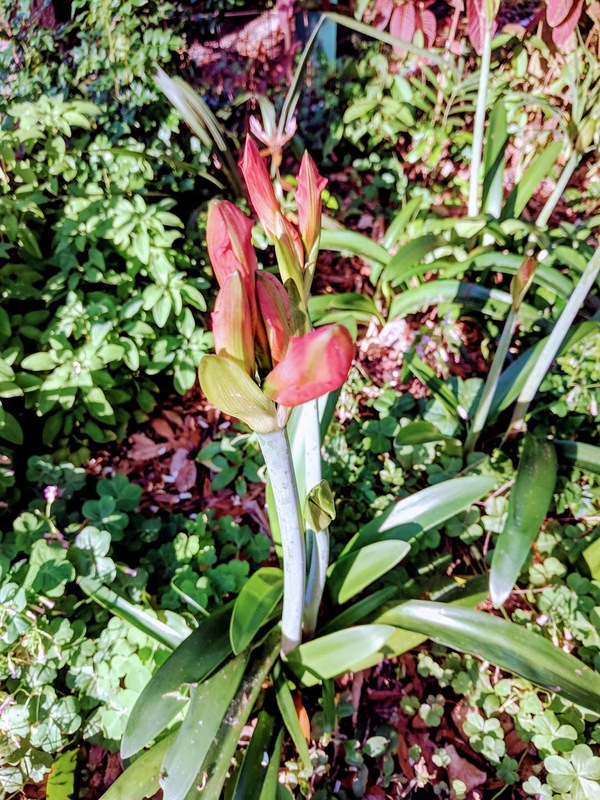 She was delighted and insisted that I plant it in the middle of a circle of banana trees next to the porch. Once that was done, the shade tossing banana trees instantly became expendable to her, and I became their defender. I lobbied for the tropical look of the banana trees and the way the rain sounded on their leaves when she sat in her screened porch during a storm. "In a few years, the Fringe Tree will be taller than the bananas. In the meantime, we just have to trim enough banana leaves to provide light for the youngster." The first year her Fringe tree bloomed, she called to let me know how pretty it was. "We may have to cut down all those bananas." "Please wait, I'll trim them back when I get over." Each year the Fringe Tree got bigger and more beautiful. Each year she looked forward to the fluffy white cloud of stringy blossoms that make a Fringe Tree spectacular for about 2 weeks. 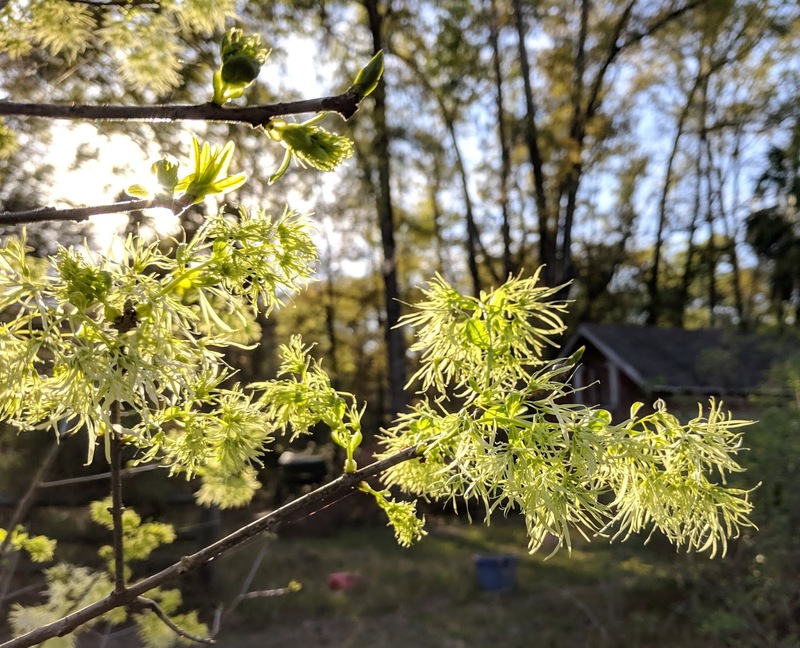 Now, ...during the first March without her, the Fringe Tree is bursting into its best show ever. Finally, it is taller than the banana trees ... so TRUCE! The bananas, like the Fringe Tree, offer a tangible connection to her. Doing yard work at the home I grew up in during this post mom era is both physical exercise and a workout in memories and emotions. While trimming around the bananas, my mind is in playback mode ... I can hear her telling the banana story as I work. Stories were repeated more often as she approached and then passed 90 ... the banana origin story was a favorite rerun. It would start with a question. "Do you remember bringing those banana trees home in your little wagon?" I remember digging a few small banana suckers up and hauling them home from my babysitter's yard down the street. Dad said they'd freeze and never make it. Dad was an excellent gardener with a true green thumb. In his defense, he was right about most anything to do with growing plants ... who knew Miss Fifi the babysitter- had a cold hardy strain of bananas? It didn't matter how I answered her "Do you remember..." question about the bananas, she would still tell it to me in great detail. And I would sit and listen while thinking, "You're going to miss this someday." Someday is here, and I do. On this last visit, my mission was to push back against the relentless advance of nature. ...Not too hard, because she had purposefully let parts of her backyard become a mini-woodland. ...Not to declare a victory, but just to reclaim a little of the open area that we had lost since we lost her. Spring had sprung, and the tiny backyard lawn was rapidly shrinking. Weeds were already flowering and going to seed in the bare ground where I had cleared away an invasive plant earlier. It was tall with clusters of blue flowers at the top and it spread by seed and rhizomes. 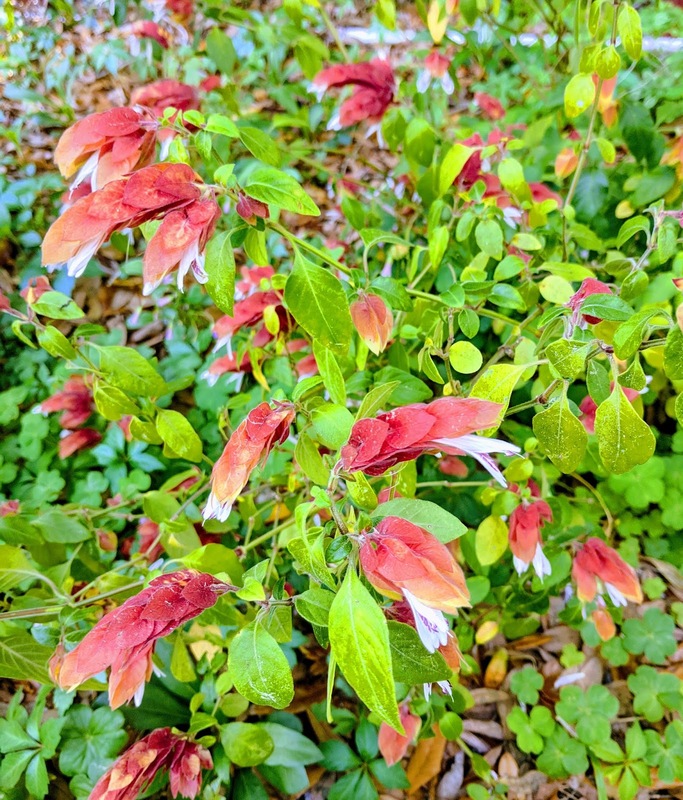 It had taken over a huge part of her yard over the years and at 5-6 feet tall, it walled off any view of the yard behind. She would not let me attack it because the butterflies liked the blossoms. I believe it is my hate for this plant that prevents my memory recalling its name. We can just call it "Voldemort". The thing about Voldemort is you can't just chop it or mow it. You have to physically pull each stem up, knowing that as satisfying as that was, the broken rhizomes you leave behind will sprout anew. Ya' just gotta keep at it, which is what I did shortly after she left us. Now it was time to tackle the weeds that had colonized the new sunny ground. I fired up the little push mower from Walmart. "Little buddy, you are about to do things you weren't designed to do." By the time that little mower and I finished for the day, my phone step tracker showed over 3 miles of walking. Mom had huge beds of Shrimp Plants surrounding the deck where she spent so many hours bird and squirrel watching. These were a favorite and she encouraged their spread. The mower and I plowed through these just enough to make paths and clear them away from the walls of the house a bit. 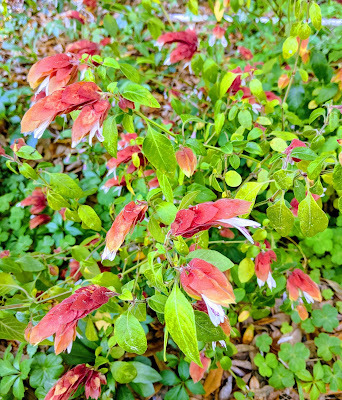 The shrimp plants were always buzzing with Ruby Throated Hummingbirds and she delighted in their antics. When Mom and Dad first retired they made a pilgrimage back to Glen Campbell, PA, Mom's hometown. 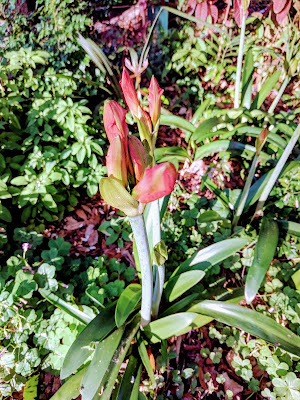 There was an estate to settle, things to choose, etc, and one of the things she brought back were some Amaryllis bulbs from the ancestral Elbel farm. 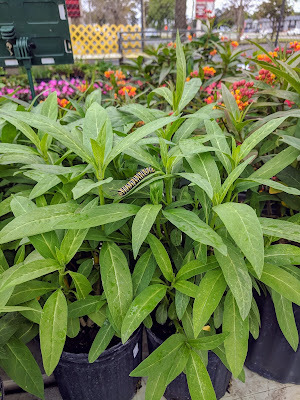 She remembered them as a kid and wanted that tangible connection to her home. So she had Dad dig up a few to bring home to St. Augustine. Like everything else he planted, they thrived and spread in her backyard. Seeing these while I worked was just another memory to wrestle with. 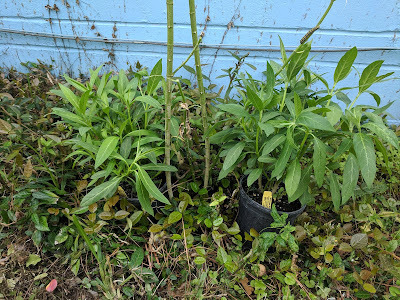 I have these growing at PFHQ too, so the connection continues ...and I am reminded that I need to pass along some of these bulbs to my kids. The story of how they got here has to go along with the bulbs of course or the plants become just another orange amaryllis. Weed-whacking along the back wall of the house, I came upon the scene above. 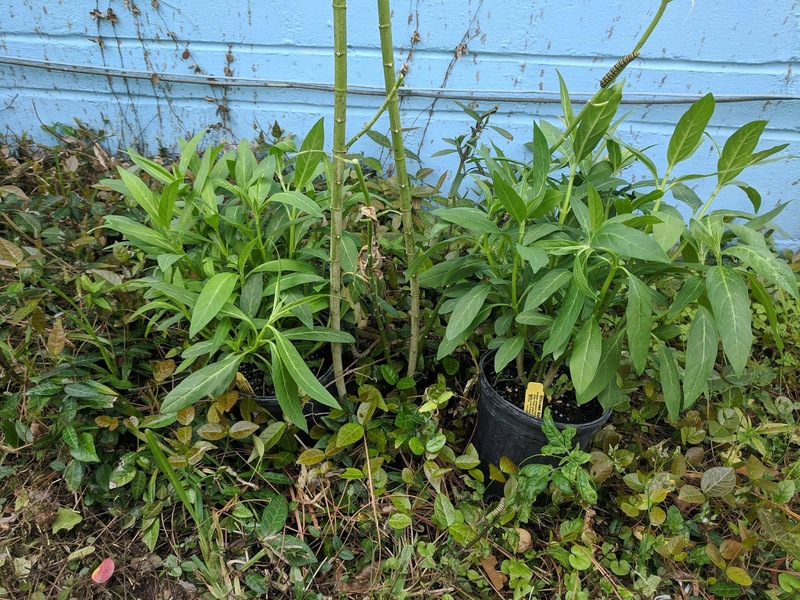 A single 4-foot tall milkweed, almost completely stripped of foliage. 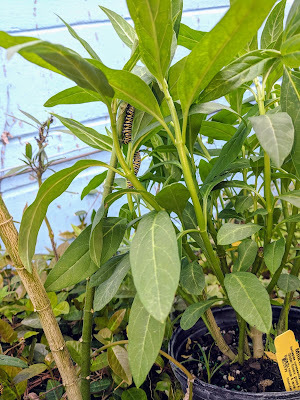 On it, were eleven monarch caterpillars. 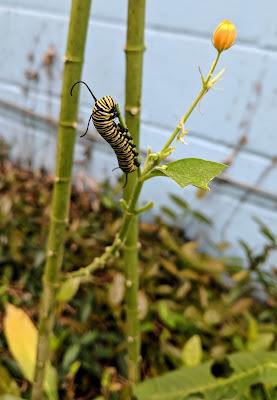 They had nothing left to eat and didn't seem to be big enough to pupate yet. Plus they were definitely hungry and still munching on what was left. I knew exactly what she would have said about this. 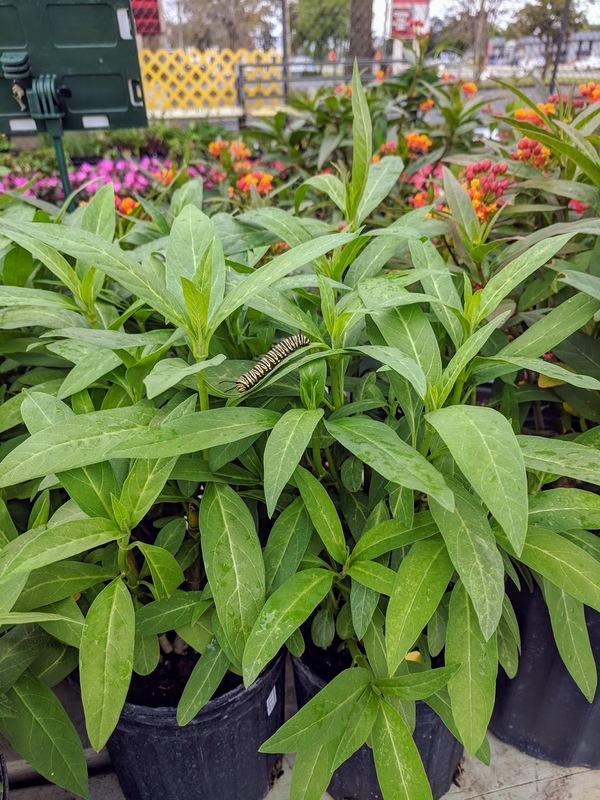 "We have to go to Ace Hardware and get some more milkweeds so they don't starve." At ACE, this one was already occupied, so I skipped it. I brought home 2 milkweeds and placed them on either side of her original naked one. Then I continued my yard work. When I returned, they had found the new buffet and were moving on to it.